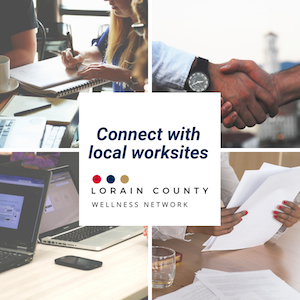 The Lorain County Wellness Network provides local, credible and timely health and wellness information to local organizations. The network meets quarterly for breakfast at locations around Lorain County, providing a forum to share local successes and resources. No cost to join. Who should attend? Employers, human resource professionals, wellness coordinators, wellness team members, occupational nurses, leaders of faith-based organizations, health ministry coordinators, parish nurses, and community leaders. Jun. 6, 2019: Helping your employees manage stress and blood pressure. Location: Riddell, 7501 Performance Lane in North Ridgeville. To learn more, email HealthEd@LorainCountyHealth.com. The Lorain County Wellness Network Advisory Committee is organized by Lorain County Public Health. The Advisory committee meets 2-4 times per year to decide topics for discussion, meeting logistics, and evaluation. Contact HealthEd@LorainCountyHealth.com to let us know if you are interested in a committee position! Learn more about workplace wellness and how Lorain County Public Health can assist you. Watch this video for ideas of how you can kick-off workplace wellness.